Growing up, on Valentine's Day, Mom would make us these big heart-shaped chocolate chip cookies. I have wanted to continue the tradition with my own boys, but the original sea-level recipe is particularly sensitive to altitude. For the past several years I've made changes to get these cookies to work where I live--it takes years because I only make these cookies for Valentine's Day. This year, with recipe testing help from Mom, we finally figured it out. Cream together the butter, sugar, eggs, corn syrup, and vanilla. Then mix in the flour, baking soda, and salt. Finally stir in the chocolate chips. Bake for 12-14 minutes until the cookies start to brown on the edges but still look raw in the middle. You can adjust the heart shape somewhat while the cookies are still hot. Then leave the cookies on the sheets for several minutes before moving the parchment to cooling racks. When I (Colette) got this recipe on the back of a bag from the Hershey's Chocolate Town, (now it's billed as Chocolate World), shortening was a common ingredient in baking and the recipe called for 1/2 c butter and 1/2 c shortening. And it called for 2 tablespoons water. Since I altered the recipe to make it with butter (which is nearly 20% water), I removed the water but I only tested this at a high altitude. If you want to see the recipe as it was decades ago, see this site. But here, I am using all butter and no water. Cream together the butter, sugar, eggs, corn syrup, water and vanilla. Then mix in the flour, baking soda, and salt. Finally stir in the chocolate chips. Line cookie sheets with parchment paper, then place the dough on the sheets in heart-like shapes. The cookies will spread a little so it's ok if your hearts aren't perfect. 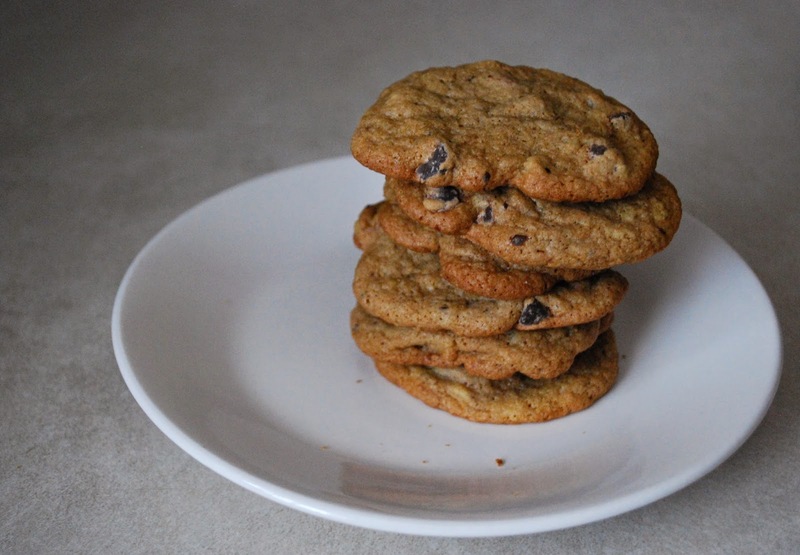 As a child I made chocolate chip cookies from the Toll House recipe on the back of chocolate chip packages. I would carefully cream the butter and sugars, and then I would sit in front of the oven waiting and watching for the exact moment to remove the perfect cookies. At least once someone was unable to replicate the cookies to her satisfaction, despite using the same recipe. This history is just to show that I have pursued the perfect chocolate chip cookie for a long time. Over the years I've messed with the recipe, reducing the butter and switching to dark chocolate chips. (Feel free to substitute semi-sweet if you prefer.) Since I moved back to the intermountain west I've made changes to both ingredients and cooking temperature to deal with high altitude baking problems. I also started making them with partial white whole wheat flour, which adds a pleasant nuttiness to the flavor but can make them dry, so I added an egg yolk. Now they're just about perfect, though there are still a couple of tweaks I want to try! If you don't want to mess with the whole wheat flour, use all purpose and leave out the extra egg yolk. Preheat oven to 350F. If you haven't thought ahead, remove butter from the fridge, cut it up into tablespoons, and set out on a plate. It will be close enough to room temperature in about 10 minutes, while you are getting out the mixer and gathering all the other ingredients. Beat butter, sugars, and vanilla in a stand mixer until creamy. I look for the color to lighten significantly, and scrape down the bowl several times. Add eggs and yolk, then mix again. Add flour, baking soda, and salt, then mix again. Finally, add the chocolate chips and nuts, and mix in. Drop roughly tablespoon-sized portions of dough onto ungreased cookie sheets, then bake for about 12 minutes until the cookies are beginning to brown on the edges. Let the cookies rest on the cookie sheets for a couple of minutes before moving them to cooling racks. For the last couple of weeks, I've been in my freezer clean-up mode and found a small brisket (only 2 1/2 pounds), a great size for two of us. I looked for ideas for cooking it and found this one. I'm glad I came across it because a braised brisket is one of the most beefy tasting cuts. It takes a little time but the recipe is super easy, especially the "onion" gravy which is remarkably flavorful and takes nothing but a blender to create. This dish will taste better if you can cook it a day ahead. But if you can't, it will taste wonderful on the day you cook it. If you can, choose a flat-cut brisket, but one with a thin fat cap for moisture retention during cooking. Turn on the oven and preheat to 325F. Pat the brisket dry and season both sides with salt and pepper. Heat a large Dutch oven or a roasting pan over medium high heat until the oil is shimmering. Lay the brisket in the pot, fat side down and brown well. Try for dark brown but not scorched. Turn the brisket over and brown the second side. Remove the brisket and set aside while assembling the rest of the ingredients. Lower the burner temperature to medium. You should have a couple of tablespoons oil in the bottom of the Dutch oven. If not, add a little as needed. Stir in the onions and brown sugar and 1/2 teas salt. Cook for 10-15 minutes until the onions have just started to brown. Add the garlic, tomato paste, and paprika and cook for about a minute to bloom the flavors, stirring constantly. Then add the wine and raise the heat to medium high and cook until the wine is reduced by about a half. Stir in the chicken broth and heat through. When it begins to simmer, add the brisket and any juices that accumulated. Cover tightly with aluminum foil or use a sheet of parchment paper under the lid of the Dutch oven. Place in the oven and slow roast for 3-4 hours, until tender when tested with a fork. Turn the brisket over every hour. Remove from the oven; place the brisket on a platter and cover to keep warm. To make the gravy immediately, place the liquids into a fat separator and the onions into a blender. When you've removed as much fat as you prefer, pour the liquids into the blender and puree until smooth. You may find it too runny so you'll need to place it in a saucepan over medium heat and cook until it reduces. Cut the brisket into thin slices across the grain. You may pour the gravy over the brisket before serving or pass the gravy among diners. You may, however, let both the roast and the onion mixture cool and place in the refrigerator. Brisket usually tastes better after refrigeration for a day. The onion gravy mixture will also have a chance to separate from the fat which you can easily remove. Follow the instructions above but reheat the gravy either on the stove top or in the microwave after blending. Reheat the brisket wrapped tightly in foil in a 300F oven. Just days after posting this recipe, I found an adaptation of the same recipe by David Lebovitz whose blog and books and read and admire. He uses a bit of fish sauce and some diced carrots and makes a few other changes. He also serves this with a fresh horseradish sauce. Take a look at his post, if you are interested. Ten years ago I moved to New Mexico and became more acquainted with its tasty regional cuisine. I was familiar with posole, a kind of pork stew, but didn't know how to cook it. Early on I did an internet search and combined several recipes until I came up with a dish that I think compares favorably with posole I get in restaurants. (I make few claims to authenticity since I'm an immigrant to the state.) I find New Mexican posole recipes differ slightly from those for Mexican pozole, many of which call for canned hominy and are more like soup than a stew. Using frozen or dried posole retains a chewiness in the corn which isn't as apparent in the canned form. Posole is often cooked in New Mexico as a Christmas tradition but it is good anytime, especially since it easy to put together. This is one of those foods that should be cooked often since the smell is part of the joy of cooking it. For information about hominy, nixtamal, and posole (pozole) see this post. This makes a very large pot of stew. It can be frozen for later use or you can modify this by halving the ingredients. In New Mexico frozen nixtamal or posole is easy to find. See note at the bottom if you can find only dried. If you don't have easy access to Hatch or New Mexican red chile you may want to substitute with anchos which are ripe and dry poblanos. Or combine with pasillas (dried chilaca peppers). I use mostly mild chiles so I get the flavor but not all the heat. If you and all those dining with you will like it hot, choose hot chiles. Wipe the dust off the chile with a damp paper towel. I usually tear off the stems and remove most the seeds because I can't handle too much heat. Roast the chile on a hot cast iron griddle or skillet (or comal, if you have one) but only for about 15 seconds on each side. The chile will darken and become more aromatic. Place all the chile in a saucepan and cover with water. Add the garlic and salt. Bring to a boil and simmer for at least 10 minutes. Allow to cool slightly or more and place the chile in a blender with about 1/2 c of the boiling liquid. Blend until smooth and set aside. Pour the posole into a colander and rinse. Check for damaged corn and remove. Place in a saucepan and salt and cover with water. Bring to a boil and lower to a simmer. Cook until the posole starts to "pop". It seems strange to me that even wet corn has this propensity, but it really does puff out of shape. It doesn't go as big as popcorn but it definitely changes shape. It will become chewy and release some starch into the water (this is good stuff). Many recipes call for the use of lard to brown the pork in. This is a traditional fat to cook posole in. You can use a tablespoon of vegetable oil if you prefer or you can render the fat from some of the fat cap on the shoulder roast. Throw some pieces of fat into the pot on medium heat and allow it to "melt". When you've got a tablespoon or so of melted fat, remove the pieces of crispy fat and brown the cubed pork over medium high heat. Lower the heat to medium and add the onions and allow to cook until soft. Add the garlic and allow to cook for a minute until no longer raw but not burned. Add the Mexican oregano. Pour in chicken broth and deglaze the browned bits on the bottom of the pan. Add the posole corn and some cooking liquid, depending on how much remains. (I often cook the pork and the corn separately until the point I think the pork is tender, about one and a half to two hours.) You can add some red chile sauce at this point to posole and to the meat mixture. Start with a couple of tablespoons first. When the meat has cooked through taste it and add more red sauce if you desire. The color of your posole will depend on how much red sauce you put in. Taste for salt, too, and add more if needed. Remember that you can serve the posole with red chile sauce to pass so diners can tweak the heat to their preference. Once combined, allow to continue to simmer for about 30 minutes or more until you like the thickness of the broth. The longer you cook it the more starches are released. Serve with garnishes more more red sauce. I've talked with New Mexicans who make their red sauce using the powdered form of red chile. This might be easier to find than whole chile. You can find instructions for cooking this with dry posole (for example see the article above and this). Since I've not tested which steps to take, I can't tell you the best method of cooking it. Next time I make posole, I'll try it with dried posole so I can make personal recommendations. I used to love Cowboy Cookies but haven't made them for years. A recent Cook's Country Magazine included this recipe which I couldn't wait to try. I made some small changes so the recipe would work at my altitude but they turned out wonderfully. Check out the notes at the end for original ingredients, particularly if you live at sea level. Place a rack in the middle of the oven and preheat to 350F and line two cookie sheets with parchment or a silicone baking mat. Place the dry ingredients, flour, baking powder, baking soda, salt in a bowl and mix to combine. In a large bowl mix the sugar, melted butter, eggs and vanilla. Stir in the flour mixture until combined. Then add the oats, pecans, coconut, and chocolate chips. For large cookies, use a quarter cup measure (sprayed with cooking spray) to portion 8 cookies onto each baking sheet. Stagger the rows so you have two rows of three along the long edges and a row of two in the middle. You can also use a large ice cream scoop but you might want to measure to be sure it holds 1/4 cup. Place one baking sheet in the oven and bake for 15-17 minutes rotating about halfway through. Bake until the cookies are slightly browned on the edges but still look shiny and raw on the top. Don't over bake unless you like crispy cookies. Remove from the oven and allow to set for 5 minutes before removing to a cooling rack. I apologize that I can only give ingredient amounts for elevations around 5000 feet and sea level. If your elevation is somewhere in the middle, I don't know what to advise except to compare your yours with these two and split the differences accordingly. It might take a few trials. These cookies are so large that you may wish to bake smaller cookies. That is perfectly fine, but they will cook for a shorter period. I haven't tried this but Cook's Country gives directions for freezing the dough in the portions on the cookie sheet. After they are frozen solid, portions can be kept in a freezer bag a couple of months. Do not thaw but place in oven (at 350F) and bake for 17-19 minutes. It has been interesting to watch food trends over the years. In the 80s quiche was popular in most of the places I lived (Michigan, Ohio, and Virginia--not so much Bahrain). It seems to me that quiches have faded somewhat in the collective mind and even though I love this, I find myself making frittata much more often. It's too bad since quiche enjoys a creaminess that is missing in some other egg dishes. This particular recipe produces a straight forward and fairly simple quiche, especially if you buy the crust. Combine broccoli, chicken, and cheese. Beat together eggs, milk, and seasonings. Pour over broccoli mixture. Mix well and spoon into pie shell. Bake at 375F for 45-50 minutes. Test by slipping a knife into the middle--if it comes out clean, it is done. Cool 10 minutes before cutting. If you do use a store-bought crust, which is a boon to busy cooks, consider cooking the excess filling in a very small baking dish--don't forget to oil it. I have used a tiny loaf pan but a ramekin would work, too. It won't need to cook as long, so check it 5-10 minutes earlier.